The name of lantern clock maker Jeffrey Bayley is a well-known one and one which sticks in my mind, probably because of the interesting 'address' he used as part of his clock signature - usually being a variant on 'at ye turnstile in Holborn'. These charming old 'addresses' run smoothly off the tongue and are not difficult to remember. Thomas Knifton and later John Ebsworth worked 'at the Cross Keys in Lothbury'; William Selwood and later Thomas Loomes worked 'at the Mermaid in Lothbury', John Barnett 'at ye Peacock in Lothbury', John Adamson 'over against the Blue Boar in Holborn', Nicholas Coxeter 'at ye 3 chairs in Lothbury', George Poole 'at ye Maidenhead in Duck Lane'. So Jeffrey Bayley's name is one with which I am very familiar, but when I came to look up what was known about him, there was precious little beyond those bare details, which I extracted many years ago from the Clockmakers' Company records and which were later published in The Early Clockmakers of Great Britain in 1981. As to examples of his work, they seem to be pretty few and far between. So what sounds at first like a 'well-known' maker, turns out to be not so well known after all. His name seems to have been spelled consistently on his clocks as Bayley - well more or less anyway, once being Baylie. In the records however it is spelled in many different ways (including Bailey, and Baylie) but of course the records were usually written by someone else and not in the presence of the person whose name they were writing. Of course some clockmakers were themselves unable to write - we know this because some of them signed documents with their 'mark', usually in the form of a cross. So illiterate clockmakers would have to rely entirely on the engraver to spell their names correctly. I have tried to keep a note of all lantern clocks going through auction or otherwise coming to my notice over the last thirty years or so and I can count only seven by Jeffrey Bayley, which are listed below. Obviously there must be others, but these are the only ones known to me. Jeffery Bayley at the Turne Stile in Holborn Londini fecit, signed above tulip centre, dated in fret TR 1653 (this was the year Bayley took his first apprentice and might indicate the year he set up in his own business), integral pillars, ball feet, dolphin frets, pictured on cover of 'In Quest of Clocks' by K. Ullyett. Jeffrey Bayley at the Turn Stile in Holburn Londini Fecit, signed above tulip centre, integral pillars, chapter ring fixed by upper lug, dolphin frets, re-converted balance escapement, replaced alarmwork, ball feet, pictured here in plates 1 to 7. Jeffrey Bayley at the Turne Stile In Holburne Londini Fecit, dolphin frets, signed above tulip centre, integral pillars, no alarmwork, ball feet, chapter ring probably fixed by upper lug, pictured on page 136 of George White's book 'English Lantern Clocks'. Jeffry Baylie at ye Turn-Stile in Holborn fecit signed above tulip centre, Tudor Rose centre, no alarm, dolphin frets, probably integral pillars, ball feet, later anchor escapement, pictured in 'Clocks Magazine' 1978, probably same clock ex Clockmakers' Co. sold at Sothebys auction Oct 1981. Jeffery Bayley nere Turn Stile in holborn, signed on fret, integral pillars, alarmwork & alarm disc lost, re-pinioned, formerly balance now anchor, ball feet, dolphin frets, auction in US 2005. Iefery Bayley neare turne Stile in hye Holborne, signed on front fret, integral pillars, alarm disc remains, alarmwork removed, verge conversion from balance, dolphin frets, sold at Sothebys June 1979, ACORN FEET, pictured here in plates 8 to 12. These few known clocks are probably an indicator that his output was not great. Some London lantern clock makers of this same period, such as Nicholas Coxeter (working 1647-1670) and Thomas Knifton (working 1648-1667) are known to have been very prolific. I know of some nineteen signed examples by Coxeter and twenty three by Knifton. Why some makers were especially prolific is difficult to say, though we can guess at some of the possible reasons. A large workforce and a large clientele would seem basic essentials. We know that both these makers produced lantern clocks for others in the trade, even though these may carry the names of the retailer or be totally unsigned, as well, of course, as those sold in their own names. A good many seventeenth century lantern clocks were unsigned and from examination of these we can determine that a good few of them were not only made in the Lothbury district, the main lantern clock making street in London, but were probably made by Coxeter or Knifton. The unsigned ones must have been produced deliberately without a signature, but we can only guess at the reasons for this. Perhaps they were supplied to provincial retailers in related trades, such as jewellers or hardware merchants or general merchants, who ordered such a clock 'from London' for a client. The work of London clockmakers was closely scrutinised by the Worshipful Company of Clockmakers to ensure a high quality product and thereby keep up the reputation of the trade. To that end the Company members were ordered to sign their work. But the existence of many unsigned examples implies that some clockmakers ignored this ruling at least some of the time. Was it perhaps because unsigned clocks could not be traced back to their maker in the event of any deficiency being found? In many provincial towns and cities by-laws enforced by local trade guilds prohibited outsiders from bringing in their manufactures to sell. It may be that unsigned clocks being supplied by certain London makers to be sold in the markets of provincial towns could be traded without the sort of comeback, which could follow if they signed them. 1. 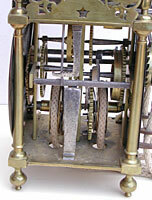 Front view of the Jeffrey Bayley clock with re-instated balance wheel escapement - no. 2 in the list. Click for closer view. 2. Right-hand view of the movement showing the hammer and decorative hammer spring counter - no. 2. I can think of one instance where a lantern clock was made in London and sent to Kendal in Westmorland. The clock was supplied, though not made, by Jasper Harmer, alias James Harmer (and with other aliases too! ), 'an ironmonger near Smithfield Barrs'. The Clockmakers' Company had several confrontations with him between 1683 and 1686 for trading when not having served an apprenticeship, and they confiscated sub-standard watches from his workshops, several of them bearing invented names. Almost certainly they were signed this way to avoid redress. A letter survives dated 1696 from Jasper Harmer to a fellow 'craftsman' in Kendal named Joseph Dawson, who had ordered a lantern clock for each of two clients. The one being sent with the letter was a thirty-hour verge pendulum example and cost three pounds ten shillings (£3.50p). He points out that he could have sent a balance wheel version for five shillings less (£0.25p) but that would have run for only sixteen hours between windings. Dawson was a second generation whitesmith and goldsmith, said to have made clocks and watches 'to admiration' - whereas we know he actually ordered his lantern clocks from Jasper Harmer. Susan Stuart in her book 'Biographical List of Clockmakers, North Lancashire, South Westmorland 1680-1900', reveals that Joseph Dawson was a shady character involved in coin clipping in the 1680s, at that time a hanging offence. We can be pretty certain that the verge lantern clock, made in London, ordered through Harmer, the dubious ironmonger, by the reprobate Dawson for his local gentleman client, would be either unsigned or signed with an invented name! This proliferation of unsigned lantern clocks, contrary to the ordinances of the Clockmakers' Company, may well explain why certain makers had a large work force and therefore why their recognisable output was considerably higher than the average. The clocks known by Jeffrey Bayley on the other hand are relatively few. There is something about Jeffrey Bayley's lantern clocks that distinguishes them from almost all lantern clocks by his London contemporaries (one exception was his late master, Thomas Pace) - and that is that the pillars have the finials and feet cast as an integral part of the whole. I call these integral pillars. The normal method with all London lantern clock makers of the seventeenth century was to have the finials and feet screw onto the pillars as separate fittings. In the West Country, centred on Bristol and Salisbury, integral pillars became the norm, but not so in London, where they are so unusual that I cannot think of any other lantern clock maker who used this method. I know there is a tiny group of very early London lantern clocks which have feet and finials on an integral pillar with a rounded base and top, but I can think of no other London integral pillar example with the normal square base and top apart from Jeffrey Bayley's with the sole exception of one clock known by his former master, Thomas Pace. So unusual is this feature that I can remember doubting the originality of one lantern clock by Bayley when I first saw it. But further research shows that all seven of the lantern clocks that I now know of by him have this feature. 3. Front view of the Jeffrey Bayley lantern clock with verge pendulum conversion - no. 7 in the list. Click for closer view. 4. Right-hand view of the movement of clock no.7 showing the decorative hammer spring counter. What does this tell us? Well it gives us a nice recognition feature for his clocks, but more importantly it tells us that he was using castings from a different source from those used by all other London lantern clock makers (except Thomas Pace?). It may mean that he made his own castings, and that he did not supply lantern clocks or lantern clock castings to the trade at large. What is the more surprising is that Jeffrey Bayley used at least two different castings for his integral pillars. One version has normal ball feet, one what we sometimes call 'acorn' feet. It is difficult to be certain but one tends to think of acorn feet as being slightly earlier than ball feet. As the pillars of each style have integral feet, this must mean there are two different versions of the pillar castings. Two of the known seven have acorn feet, five have ball feet. I have been able to measure only two of his lantern clocks, and surprisingly the sizes differ. The acorn foot version (number seven above) measures 10.5 inches pillar height; the ball foot version (number two above) measures 10.25 inches in pillar height. The acorn foot version had broader plates ( 6 inches against 5/75 inches), a wider chapter ring diameter ( 6.25 inches against 6 inches) and a wider chapter ring (1.25 inches against 1inch). So not only did Jeffery Bayley make his pillars different from other London clockmakers of the day, he changed the form of them too, whilst still keeping them different! He was really making life hard for himself. The only known lantern clock by Thomas Pace, Jeffrey Bayley's late master, has integral pillars with an acorn foot, very much like those by Bayley, and I cannot help wondering if this means that the two men used the same castings for these particular clocks. Of the only two examples by Jeffrey Bayley that I have been able to examine personally, one had a strange and somewhat old-fashioned feature. The earliest chapter rings were attached by one upper lug and two lower chapter ring 'feet', the lug passing right through the front movement bar, where it was pinned and held both dial and chapter ring in place. The normal, and later, method was to have the chapter ring attach to the dial by four feet, then the dial attach to the clock by a downward-projecting lower lug into the baseplate and two pins holding it in place at the top. Clocks no. 2 has this early upper lug feature, which can also be deduced on other clocks by the absence of taper pins showing at the top of the dial front. Clock no. 3 shows no such pins, nor does clock no. 1, and it is very likely therefore that the dials of these two clocks are also fastened by the early upper lug method. 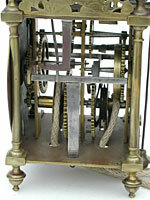 Thomas Pace's clock also has no upper dial front pins, implying its dial too fastened by the earlier upper lug method. It may be significant that the first three clocks are signed on the upper dial centre, and the last three on the front fret, though Bayley's signatures vary and are difficult to set into any particular sequence. His relatively small output, judging by the relatively few surviving lantern clocks, may mean that he had a small workforce. What do we know about his life and workforce? Not a great deal. He was apprenticed through the Clockmakers' Company in September 1637 to Thomas Pace, a maker of lantern clocks who worked at the Crown in Fleet Street from at least 1634 to at least 1646, and perhaps later, though the last written record to mention Pace dates from 1646. I know of only one lantern clock by Thomas Pace, a restored balance wheel example, which was sold at Christies auction in London in July 1997. It was catalogued as dating from c.1660, but I think this was a conservative dating and it was probably pre-1646. This clock had integral pillars and a chapter ring that was probably attached in the earliest manner by a single upper lug. It also had acorn feet. These are features which were continued, at least some of the time, by Jeffrey Bayley. The apprenticeship seems not to have been a happy one. There was some sort of serious dispute whereby both master and apprentice were brought before the Clockmakers' Company court (in 1642 and again in 1646, the year Bayley finished his term) but neither would relate the details of their quarrel. In March 1646 (today we would call it 1647) Jeffrey Bayley was freed from his apprenticeship and after that we never again hear the name of Thomas Pace! Very intriguing. In October of 1647 Bayley married Desabella Chesterman at the church of St. Bartholomew the Less, London. Either he worked for some other master at this time or he worked alone, that is without an apprentice, which was unusual. We know he did not take his first apprentice till 1653, which might just mark the year he set up in business in his own right, as one of his clocks bears that year on its fret. Another apprentice was taken in 1654, another in 1657, and a further one each year in about 1661, 1664, 1669, 1670, 1672, 1683, 1687. One record says that he worked in Westminster, yet his known clocks are all signed at Holborn. He became Clockmakers' Company Assistant in 1665, Warden in 1670, Master in 1675/6, and last attended in 1693, about which year he probably died. He had a working life (working in his own right that is) of at least forty years, perhaps more. Yet he seems to have left comparatively little work as a testimony of that long spell. Those lantern clock makers we mentioned earlier, Thomas Knifton and Nicholas Coxeter, left far more clocks yet had only about half of Jeffry Bayley's working life. There is something else a little odd about Jeffrey Bayley's lantern clocks. All those I know were built originally with balance wheel escapement. All were modified later to other forms of escapement to improve timekeeping and lengthen the time between windings - as was always the case with balance wheel clocks. Then some were re-modified back to their original form of balance wheel again for the benefit of collectors who like to see them in their original form. Why is it odd that his clocks were all balance wheel examples? Well the verge pendulum was first introduced into clocks in 1658, though most London lantern clock makers did not adopt this form of escapement for some years after that. We have already seen that Jasper Harmer was still supplying balance wheel lantern clocks in the 1690s, so occasional demand for this old-fashioned type continued in some degree. Nevertheless verge pendulum lantern clocks were being made in London as a regular version from the 1670s. Yet all Jeffrey Bayley's known clocks retain the balance wheel form, even though we know he was working through the 1670s and 1680s and into the 1690s. By their style too we can see that that the only lantern clocks we know by him are from the earlier part of his working life. Had he perhaps stopped making lantern clocks by the time that verge pendulum versions were being made? That would certainly explain the small number which are known in total. If he had stopped making lantern clocks, then what was he making, for we do not seem to know of bracket clocks or longcase clocks by him? Was he a man of private means, who took early retirement? Did he marry into money? One day we may find some sort of explanation, but for now, all we can say is that his lantern clocks are unique amongst London ones and are very rare items.